Picture it…A restaurant down a side street off traffic choked Cach Mang Thang Tam Street deep in Saigon’s District 10. OK. So it sounds like anywhere in Saigon, right? Well, not so fast there for this semi-open air barbecue mecca called Làng Nướng Nam Bộ veers far off the normal trail in the best of ways. A good rule of thumb for finding amazing food is to follow the locals and follow the locals our Monday Madness food group did. Just walking up to this place is a sensory overload. In a country where most food joints are shophouses about as wide as a 1978 Caprice Classic is long, this two story palace rises like some sort of out of scale temple to all things charcoal can singe. Two grills out on the street, smack dab in the middle of the entrance where people walk I might add, send fragrant smoke signals all over the place. 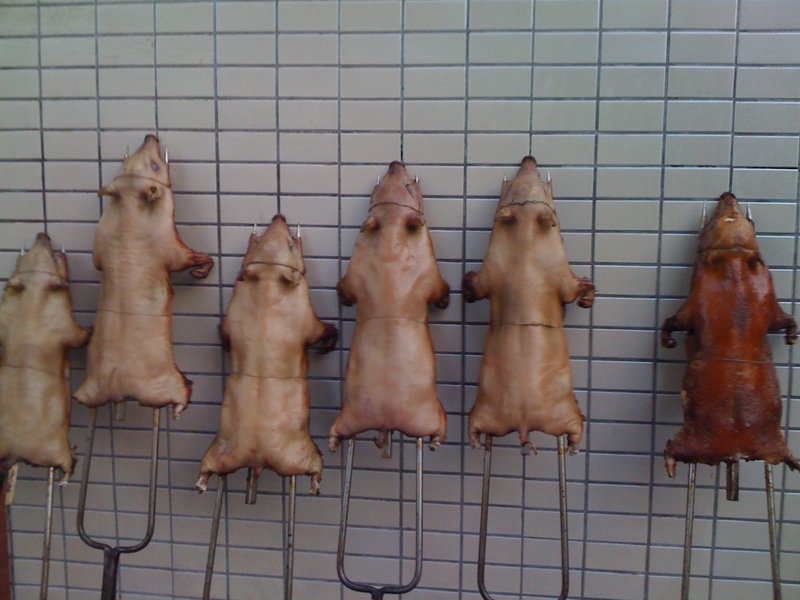 Baby boars skewered on pitchforks lining an outdoor wall like columns of e. coli are what we came for. Oh yeah, that’s a sanitary sight isn’t it? But who cares…Great taste overrides any of the nasties we worry about so much in the west. A guy stands out there in the heat rotating the hollowed out carcasses back and forth as they make satisfying sizzles and pops over impossibly hot embers. The sidewalk display of boar is the perfect only in Vietnam type prelude to some seriously gaudy décor that is an amazing testament to just how tacky interior design can be. Huge ornate chandeliers presumably laced with cubic zirconium, plastic patio furniture, strips of neon and a crappy sound system belting out “Happy Birthday” over and over again let everyone know we aren’t exactly in Kansas anymore. I love it. Actually it’s a lot like some Tunica, Mississippi casino gone horribly wrong but mercifully without all the slot machines and old women chain smoking through their oxygen masks. 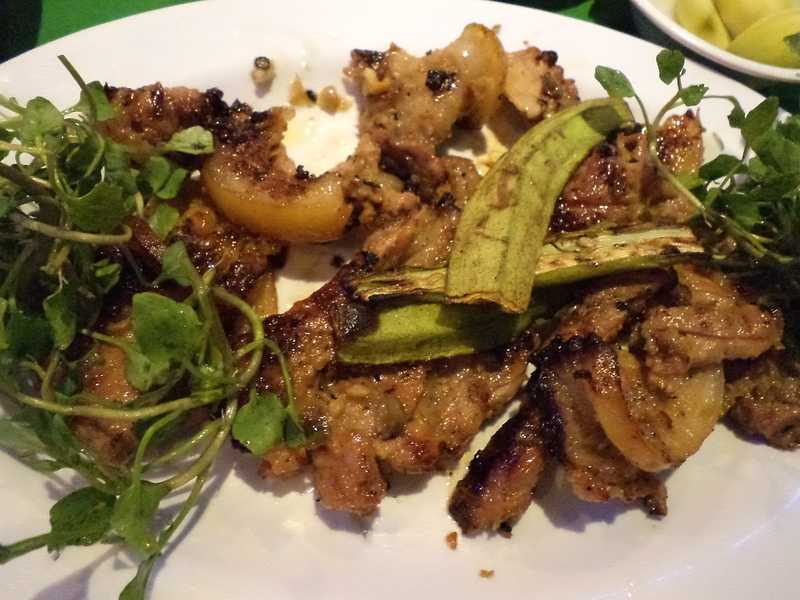 We took a gamble of a different sort on what to order and ended up with a table groaning under the weight of grilled chicken, grilled boar and some sort of beef steak. Of course the chicken looked like someone hacked a bird with a machete before tossing the chunks including feet and head on the grill, but great taste abounds once the juicy meat is carved away from the rest of the crispy and crunchy bird. 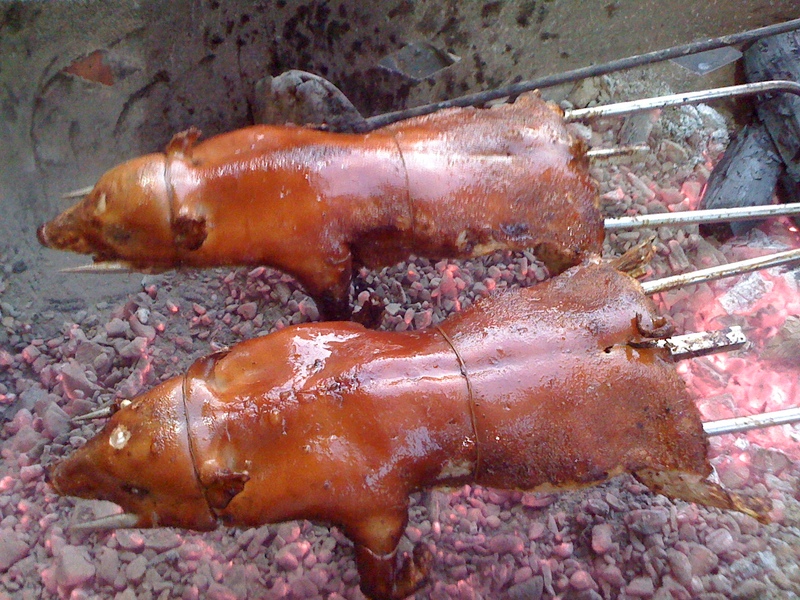 A marinade of what tastes like Chinese five spice powder and honey works so well with the wild boar, too. Of course this was the same boar culled from one of those salmonella sticks out by the entrance. Actually the entire meal was amazing right down to the fried tofu, steamed vegetables and some sort of fried sticky rice cakes. They even brought out an appetizer of tiny black and white eggs with the fertile embryo gestating inside. I tried them, and we’ll just leave it at that.